The Chimney Sweep Boy and the Goldsmith: the Ancient Origins of the Doctrine of Spoliation. Spoliation of evidence is one of the oldest doctrines in the common law. It is fundamental to our idea of a fair trial. If one side destroys evidence that could harm the, then other side doesn’t have a chance. This class examines Judge Paul Grimm’s opinion in Goodman v. Praxair Services, Inc. 632 F. Supp. 2d 494 (D.Md. July 7, 2009). Here Judge Grimm discusses the origin of the doctrine of spoliation in the 1772 case of Armory v. Delamirie, 1 Strange 505, 93 Eng. Rep. 664 (K.B.1722). The class begins with Professor Losey’s imagination of what it must have been like to sit on the bench that day in 1722 and hear that case of the chimney sweep boy and the jeweler who stole his ring. It is one of his favorite stories and an important case in legal history. To help evoke the mood Losey not only quotes the actual words of the legal opinion, but also the words of the great Charles Dickens. It was the best of times, it was the worst of times. It was the year of Our Lord one thousand seven hundred and twenty two. Sir John Pratt, the Lord Chief Justice of England and Wales, and his assembled jury at the Court of the Kings Bench were preparing to hear an odd civil case, Armory v. Delamirie, brought by a chimney sweep boy. Sir Pratt had just returned to the bench after serving as the interim Chancellor of the Exchequer for two months at the request of King George. He was glad to be back to the Kings Bench, but yesterday had been hard. The jury convicted a boy of pick-pocketing, one of 240 capital offenses, forcing him to sentence the poor lad to death by hanging. Sir Pratt was glad to be hearing civil trials today. After the case was called, Judge Pratt saw the plaintiff, Marc Armory. He was a young lad, dirty, and black with soot as only a chimney sweep’s apprentice can be, but unlike the doomed pickpocket of yesterday, he had a confident, grim air of determination. Young Mr. Armory had had the audacity to bring suit in trover against a prominent London goldsmith, Shannan Delamirie. Armory sought damages for Delamirie’s alleged wrongful taking of two valuable gems. Armory had no Barrister to assist, while the jeweler, Delamirie, had a lawyer of the King’s Bench at his side. Still, Chief Justice Pratt would hear this boy out and help his story be told for the jury to decide. For he did not much like the Lord who was defendant’s Barrister, and liked even less the looks of Delamirie. The defendant Delamirie was sitting at defendant’s table. He was a mere man of business, an elderly, pimply-faced, vegetable-diet sort of man, in a black coat, dark mixture trousers, and small black gaiters; a kind of being who seemed to be an essential part of the desk at which he was writing, and to have as much thought or sentiment. No, Lord Chief Justice Pratt did not like this French goldsmith. He would do what he could to help the jury do justice that day in the Kings Court. The chimney sweep boy’s story began with light and hope. He told of finding a ring quite by chance in the dirt by the side of a road. He saw a glittering among the ash and picked it up. He discovered it was a ring, and after cleaning it, realized that it had two jewels of the finest water. Armory hoped that his fortune was now made, that he could buy his way out of servitude from his cruel master Gamfield. He had only to find out the value of his fortune and seek to sell it to an honest jeweler. Armory’s tale soon turned to darkness and despair upon entering the store of Delamirie. There he was eyed suspiciously by the jeweler’s apprentice, a boy of his own age named Thompson. Armory told Thompson that he had found a ring and wanted to know its value. When Thompson saw the ring, he told Armory that the two stones might have some slight value, but he could not possibly know for sure until he removed the stones from the ring to weigh and examine them. The jury listened to this testimony with rapt attention. They guessed what would happen next. Armory did not want to part with his precious ring, but he saw no way around it. He would have to let him weigh the stones to learn their value. So, the goldsmiths’s apprentice took the ring to a back room while the master, Delamirie, stayed to keep an eye on the chimney sweep boy. The goldsmith’s apprentice then called out that the weight of the stones showed their value to be three halfpence. The master jeweler then offered to pay that sum to the boy, telling him that was all he could get for it, that he should take it quick and get out of the store. He knew that he had stolen it from someone’s chimney and should be happy to get anything. The boy refused the three halfpence. He had dreams that the ring and jewels might be worth ten pounds, more than enough to buy his way out of indentured servitude and start his own chimney sweep business. Armory demanded ten pounds, and Delamirie just laughed and told him to leave. Armory demanded the return of the ring and began shouting. The goldsmith’s apprentice came back and handed him the ring and chased him out of the store with a knife. Armory looked and saw the ring no longer had the jewels. Its sockets were empty. Delamirie then knew that his only hope was to try to find justice in the Kings Court. After Armory’s own testimony, two more witnesses were called in his behalf. They were goldsmiths who were competitors of Delamirie. They had examined the ring and from the size of the sockets estimated the approximate range of value of the gems that could fit in them. The price ranged from a half a pound, if the gems were of poor quality, to a high of ten pounds, as the boy had dreamed, if in fact the jewels had been of the finest water. Next the elderly goldsmith, Delamirie, and his apprentice gave their testimony. They told a different tale, but did admit that the chimney sweep boy brought in a ring with two small stones in it. They said they inspected the stones and that they were, in their professional opinion, of very poor quality, worth at best three halfpence total. Now it is true as lawyers hold that there are two kinds of particularly bad witnesses–a reluctant witness, and a too-willing witness. The goldsmith and his apprentice were both. Their story had the hollow ring to it of convenient lies. Judge Pratt was a wise man who had heard many witnesses testify under oath. He had known a vast quantity of nonsense talked about bad men not looking you in the face. Don’t trust that conventional idea. Dishonesty will stare honesty out of countenance any day in the week, if there is anything to be got by it. The Lord Chief Justice asked Delamirie to show the two stones to the jury and tradesman in attendance so they could see for themselves their size and brilliance. That is when all were told that the stones had been lost, accidentally thrown away by Delamirie’s assistant after the suit had been filed. Delamirie’s lawyer then spoke up, noting that it was a shame they were gone, but it was just an accident and they were of no value anyway. This whole suit was just a pig in a poke, drawing a fine laugh from the jury. The Barrister argued that the plaintiff had completely failed to prove that the stones had any value. Obviously the boy did not know, for that is why he came to the goldsmith to begin with. The other tradesman who testified did not know either, for they had never seen the stones and did not know their quality. Delamirie’s barrister argued that Armory’s action in trover should fail because he had no proof of ownership. It was obvious that the boy had found the ring in a chimney while practicing his trade. He was not its rightful owner. The boy was just a thief. The goldsmith, once possession of the chattel was tendered to him, had as much right to the stones as the boy. Neither had received the stones by purchase or inheritance. The fact that he had since misplaced the stones was of no importance because the boy did not own them anyway. He cited to several cases to support his arguments. Several of the law clerks were seen nodding in agreement to the points of law and learned case discussion, but not Judge Pratt. He knew full well that there is a wisdom of the head, and a wisdom of the heart. He also knew from experience that if there were no bad people, there would be no good lawyers. Of course, poor pro se Armory had nothing to say in response to the learned brilliance of opposing counsel. He was beginning to wonder why he had ever spent the half pence to bring this suit. The case was fully presented in an hour and it was then time for the Lord Chief Justice to render his charge to the jury for the King’s justice to be dispensed. At that point, the Lord turned to the jury and began to speak in his deep authoritative voice. He was wearing his full red and white robes, elaborate gold chain, and finest wig. That unless the [goldsmith] did produce the jewel [and he did not], and shew it not to be of the finest water, they should presume the strongest against him, and make the value of the best jewels the measure of their damages. After that instruction, more like an order, there was no doubt how the jury would rule. They left to meet in private to decide and returned ten minutes later. The verdict was handed to the Chief Justice. The jury had ruled for the young chimney sweep boy and awarded him the full ten pounds requested. That was a vast sum of money in those days. The defendant was shocked. There was no appeal. The chimney sweeps and other tradesmen in the court stood and cheered. The people’s faith in the government was renewed. The Chief Justice left the court room with all rising before him, a few even bowed their heads. His demeanor never changed, not even a smile. But he had a pleasant thought in his head for a change: It is a far, far better thing that I do, than I have ever done; it is a far, far better rest that I go to, than I have ever known. 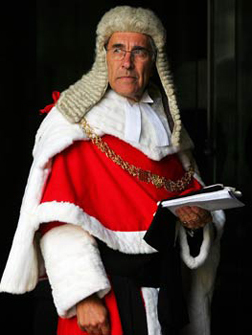 The Lord Chief Justice had not been sleeping well those days. He was one of the most powerful men in the country, if not the world. He possessed a vast fortune and had many great accomplishments to his name. Little did he know that they would all be forgotten in the dust bin of history, save for this one small act of kindness to a dirty chimney sweep boy. And what of the lad? The chimney sweep boy sat stunned too. He was surrounded by his tradesman friends who patted him on the back. Nearby too were a horde of well-wishers, including several lawyers now more than willing to help the boy to collect his judgment. Yes, the civility which money will purchase, is rarely extended to those who have none. The chimney sweep boy was overjoyed with the justice of the Kings Bench. His life was changed forever. As Charles Dickens said, whose other quotes are italicized above: A boy’s story is the best that is ever told. This historical event, obviously somewhat fictionalized here, is forever memorialized in the written opinion of Lord Chief Justice John Pratt, which is still studied in law schools around the world. Armory v. Delamirie, 1 Strange 505, 93 Eng. Rep. 664 (K.B.1722). Here is the full text of this opinion. It is the first case in the world to be won by an adverse inference instruction to the jury as the result of bad faith spoliation of evidence. 1. That the finder of a jewel, though he does not by such finding acquire an absolute property or ownership, yet he has such a property as will enable him to keep it against all but the rightful owner, and subsequently may maintain trover. 2. That the action well lay against the master, who gives a credit to his apprentice, and is answerable for his neglect, Jones v Hart, Salk 441. Cor. Holt CJ, Mead v Hammond, supra. Grammer v Nixon, post, 653. 3. As to the value of the jewel several of the trade were examined to prove what a jewel of the finest water that would fit the socket would be worth; and the Chief Justice directed the jury, that unless the defendant did produce the jewel, and shew it not to be of the finest water, they should presume the strongest case against him, and make the value of the best jewels the measure of their damages: which they accordingly did. The doctrine of spoliation originated in England in 1722 in the case of Armory v. Delamirie, 93 Eng. Rep. 664 (K.B.1722). See, e.g., Sullivan v. Gen. Motors Corp., 772 F.Supp. 358, 360 n. 3 (N.D.Ohio 1991) (“At least two federal courts have traced the origins of [the spoliation doctrine] to Armory v. Delamirie.…”) (citing Welsh v. United States, 844 F.2d 1239, 1246 (6th Cir.1988); Nation-Wide Check Corp., Inc. v. Forest Hills Distribs., Inc., 692 F.2d 214, 218 (1st Cir.1982)); Stefan Rubin, Tort Reform: A Call for Florida to Scale Back its Independent Tort for the Spoliation of Evidence, 51 Fla. L.Rev. 345, 346 (1999) (“Perhaps the earliest recorded decision to recognize and reprimand the spoliation of evidence was the eighteenth century decision in Armory v. Delamirie.”); Lawrence B. Solum & Stephen J. Marzen, Truth and Uncertainty: Legal Control of the Destruction of Evidence, 36 Emory L.J. 1085, 1087 & n. 4 (1987) (noting that an unfavorable inference for spoliation of evidence is of “ancient lineage”) (citing Armory, 93 Eng. Rep. 664) (citations omitted)). The law, in hatred of the spoliator, baffles the destroyer, and thwarts his iniquitous purpose, by indulging a presumption which supplies the lost proof, and thus defeats the wrongdoer by the very means he had so confidentially employed to perpetrate the wrongdoing. Pomeroy v. Benton, 77 Mo. 64, 86 (1882). Goodman v. Praxair Services, Inc.
Goodman is another of Judge Grimm’s law review articles cleverly disguised as a discovery order. Goodman v. Praxair Services, Inc., _F.Supp.2d_, 2009 WL 1955805 (D.Md. July 7, 2009). Judge Grimm here writes a long scholarly opinion on a motion for sanctions in a breach of contract case. It is an excellent compilation of the law of spoliation sanctions, especially in Judge Grimm’s federal jurisdiction in Maryland, but also of great use to e-discovery lawyers everywhere. This is the third in a series of similar scholarly orders by Judge Grimm in small cases. The first was Lorraine v. Markel American Ins. Co., 2007 WL 1300739 (D. Md. May 4, 2007), which I wrote about in The Admissability of Electronic Evidence. The lawyers in this case involving $21,900 in insurance proceeds were surprised when their cross-motions for summary judgment were denied for failure to lay a proper foundation for the electronic documents submitted to support these motions. Judge Grimm’s 101 page opinion reads like a law review article and collects the law in the U.S. on the admissibility of electronic evidence. The second was Mancia v. Mayflower Textile Services Co., Civ. No. 1:08-CV-00273-CCB (D. Md. October 15, 2008). His 30-page discovery order in this suit for unpaid overtime provides an excellent overview of the federal rules and other law that require a cooperative approach to discovery. Now with Goodman, we have another great scholarly opinion in an otherwise unremarkable case, unusual only for the fact that it features a pro se plaintiff in federal court. The plaintiff, Marc Goodman, is suing a large corporation for a $30,000 bonus he says is due to him under a consulting contract. The defendants are represented by one of the biggest and best law firms in the country, and – here is the amazing part – Mr. Goodman is winning. It is the story of the poor little chimney sweep boy all over again, but this time it is email, not jewels, and the underdog plaintiff is a consultant. A few months after I first wrote this article, Marc Goodman emailed me and, among other things, sent the attached photo of himself in Dickensian costume. It was part of a larger magazine cover photo that was taken well before my article. A clear case of life imitating art imitating life. Quite strange really. Anyway, back to the case. The defendants admit they lost their email, but say it was not on purpose, besides they were of no value anyway. They contend that Goodman’s motion is just a pig in a poke desperate move by a man who cannot prove his case. After all, the defendant’s CEO, Shannan Marty, printed out all of the emails of importance and the paper copies were produced. Defense counsel went so far as to demand that Goodman himself be sanctioned, not them, for bringing a frivolous motion. A tad arrogant, eh? Know your judge, I say. There is no evidence that has been brought to the Court’s attention to suggest that Tracer’s counsel instructed Marty to implement the litigation hold, or that any other Tracer employees or consultants were advised to implement a litigation hold. Goodman v. Praxair Services, Inc., supra at *6. Hmm. Way to go defense counsel. Judge Grimm was also not pleased by the pig in a poke argument, especially their contention that the production of the paper print-outs of all of the relevant emails proves that nothing of value was lost by the destruction of the email. The argument of an accused spoliator that it did not violate its duty to preserve evidence because it retained the “relevant” information and only deleted “irrelevant” information rings particularly hollow. The ultimate decision of what is relevant is not determined by a party’s subjective assessment filtered through its own perception of self-interest. The Goodman opinion goes into great depth in addressing the issue of when a sanctions motion should be made. This analysis was made in response to defendants’ argument that the pro se plaintiff’s motion should not even be considered because it was filed too late, after the close of discovery and filing of summary judgment motions, but before they were ruled upon. Judge Grimm also went to great lengths in Goodman to explore the issue of when a litigation hold should have been triggered. He found that the duty to preserve was triggered by a letter from Goodman dated January 5, 2001, which Judge Grimm says “openly threatened litigation.” Id. at pg. *6, *13. I read the letter quoted in the opinion and must respectfully disagree. Id. at pg. *5. It just seems like another in a series of vague threats to me and should not have triggered a burdensome litigation hold duty. Why Judge Grimm labored so long over this fact question is beyond me, because Goodman’s next letter of February 19, 2001, wherein Judge Grimms admits “Goodman markedly ratcheted up the dispute,” caused defendants to consult with their attorneys for the first time regarding Goodman’s demands and implement their version of a litigation hold. The real problem here was not the timing of implementation of the hold, it was the inadequacy of the hold. Judges should be conservative when using hindsight to pick a trigger date. Parties are not blessed with clairvoyance and should be given the benefit of the doubt. Litigation holds are expensive to implement, well at least they are when done right, and parties should not be required to have a hair trigger to avoid later possible sanctions. Of course, the six week difference in this case was of no importance here whatsoever, which is what makes the analysis so mysterious. The CEO instituted a litigation hold in February 2001, by consulting an attorney and telling herself not to destroy any more emails. I kid you not. According to the opinion, that is all she did and, as mentioned, the law firm did nothing further. Since the spoliation complained of here came years later when the computers were recycled and wiped, this parsing of the meaning of “reasonably anticipated litigation” for a trigger date by reading between the lines of letters was of no real importance. [D]ocuments are considered to be under a party’s control when that party has “ ‘the right, authority, or practical ability to obtain the documents from a non-party to the action.’ “ Id. (quoting Bank of N.Y. v. Meridien BIAO Bank Tanzania Ltd., 171 F.R.D. 135, 146-47 (S.D.N.Y.1997)). Apart from Goodman’s conclusory statements, no evidence has been presented to demonstrate that Tracer/PSI had any legal control over documents prepared or maintained by Wilson. *23 In conclusion, Goodman’s Motion is granted in part and denied in part. Specifically, he is entitled to an adverse jury instruction fashioned by Judge Garbis with respect to Tracer/PSI’s failure to preserve Marty’s laptop and Marty’s failure to preserve her relevant emails and documents. The appropriate instruction would be a general adverse instruction that permits, but does not require, the jury to draw an adverse inference against Tracer/PSI as a result of its violation of the duty to preserve relevant evidence. All other requested relief is denied, with exception to Goodman being entitled to seek reimbursement for costs, exclusive of attorney’s fees, properly apportioned to the Motion filed and relief received. I turn to Dickens again for the final four quotes to conclude this story of destruction of electronic evidence, justice, encouragement, and hope. encourages another person to be brave and true. SUPPLEMENTAL READING: Read the Armory and Goodman opinions. It is somewhat amazing that the problem of spoliation still remains front and center after all of these years. Do you think this will continue in the future. I do. It has to do with human nature. We can change FRCP all we want, but that does not change the proclivity to cheat. EXERCISE: Can you think of any other historic cases in the common law, a hundred years or older, that still have an impact on the modern practice of electronic discovery law? How about some more quotes of Charles Dickens that in some way pertain to e-discovery? How about some other authors in the 100+ years ago range. These are tough questions, especially of you were not a literary major, and no worries if you strike out. But if you do come up with something, please let Ralph know. He always likes those kind of things.